The Fashionable Outragers Inc. is having a field day smile emoticon Horror of Horrors has happened! An ‘innocent man’ ('innocence' and 'guilt' deduced on the basis of heresay and individual persuasions, before even preliminary investigations have produced any definite conclusions), what’s worse, from the minority community, has been beaten to death by a ‘zealous Hindu mob’ (according to the secular liberals), and the people who are supposed to be inertly non-violent to endless provocation have fallen from the ‘Gandhian’ ideal set for them (according to the Nelson-eyed humanists, for whom Hindu tolerance is to be measured not relative to a context, but in absolute terms). 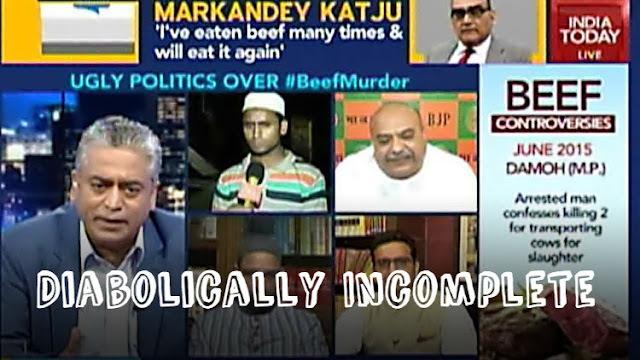 In the reportages of the incident of mob violence in Dadri village, (ref: TOI, Yahoo, TheWeek, Deccan Herald) the media has succeeded once again in distorting reality by selectively highlighting (even deliberately misrepresenting) facts and adding concocted details for certain effect. In spite of the fact that concerned authorities have repeatedly clarified that there is a history and background to the violence, the media has assiduously blacked out every other aspect of the incident except those which give it the appearance of a sensational 'hate crime'. The incident seen in isolation and interpreted out of a context would paint a picture of a dreadful wrong perpetrated by ‘religiously motivated’ people and ascribe such guilt squarely to one side. Before any investigation to the circumstances and wherefores has taken place, summary media trial and judgment to the accompaniment of loud and plentiful denouncements from predictable quarters will ensure that an indelible perception has been created which will abide when the actual particulars of the event come out in time, but the events cease to hold the interest of the public. Repeat this trick hundreds of times and the objective of equalization of the aggressor and the aggressed upon is successfully achieved. A look at the events relating to cattle theft in India will show that the cases of these leading to violence are neither recent (as alleged in mainstream reportages that these have been happening ‘since the “Hindu nationalist BJP” came to power at the centre’ - (ref: News18, NYtimes, NewIE, Indian Express) nor isolated (ref: NewIE, TOI, Daily Sun) and from statistics world over, not a local phenomenon either. It occurs in almost every country with vast farming tracts from the most developed to the poorest, with nearly the same reactions ranging from shock, indignance, anger and grief from owners and community over inhumane, indiscriminate butchery (in some cases burning alive for immediate consumption, of nursing cows and calves by cruel, unscrupulous cattleraiders), and circumstances, including the fact that authorities have been singularly unsuccessful in containing this menace as cattle thieves get more and more intrepid, organised and well-armed. Ranchers communities have no choice but to organise themselves in local vigilance bands to protect their livestock from theft and illegal slaughter and on some occasions have been known to take law into their own hands, even challenging powerful federal agencies and law-enforcement. In a country like India with a deep traditional regard of life-forms, exemplified in particular in the reverence with respect to the cow which is seen as a symbol of motherhood, the reactions are bound to be emotional, particularly in rural areas and communities where cattle is still seen as property and a means of livelihood. The emotion with respect to milch cattle is far more cultural than evoked purely by religious norms (diktats, there are none in the majority Hindu religion). This is similar to the horse and dog being protected from slaughter in several European countries and Americas, which is owing to cultural sensibilities of the people who associate historic qualities of loyalty and companionship (the same in Hindu culture however with respect to the cow is ridiculed!) 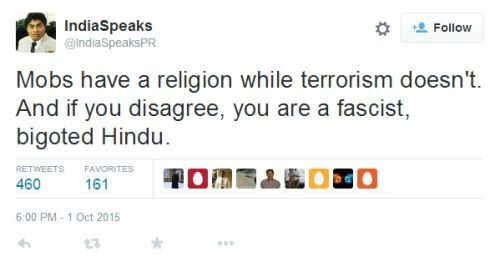 There are not just Hindu but Sikh and Muslim cow protection groups. Historically too, cow slaughter has been outlawed by several Muslim regimes as well. Depletion of Indian breeds of cows is a very realistic threat and the scale and spread of smuggling alarming by all indices. A trend peculiar to India is also that the smugglers involved in cattle theft belong overwhelmingly to one specific minority religious community. Any flare-up over cattle rustling therefore immediately gains a religious colour and gets exploited by demagogues of all hues. The audacity of the smugglers in spite of express bans, disregard for law and cultural sensibilities of the majority community (routine instances of provocation, desecration of temples by throwing meat into temple precincts, miscreants surreptitiously placing heads of slaughtered cows in Hindu settlements to incite passions, legal activism, etc.) are by no means indicative of timid demeanour of people from a vulnerable, insecure minority, but one aggressive, offensive and organised and aware of their political clout and efficacy of ideological manipulation by acting as a cohesive group. Any violent retaliation in defence (admittedly prompted at times by prejudice than definite blame) and attendant factors of skewed media reporting gets immediately interpreted as one-sided aggression and easily blurs the lines between the preying and the preyed upon. There can however be no dilution of the fact that cattle rustlers are dangerous criminals and communities by and large defenceless before them and very likely would react violently in case of perceived threat. Also, the fact that cow-slaughter is illegal in UP as in most of India should not get lost in the parry of opposing views. Attempts to manipulate this most recent incident along the lines of ideological allegiances or hyperventilation on 'lost secular fabric' of the country, impassioned lamentations on the 'signs of growing intolerance of Hindus' are at worst malintentioned and at best, emotional outbursts lacking sense of proportion, reactive and in a hurry to declare their dissociation with the 'wrong of their society', acting in the same lynch mob fashion that they criticise and by no means indicative of responses of a thinking, aware nation. Objective commentaries by dispassionate, thinking individuals, with any social or historic perspective and insight are rarely seen. Needless to say, these serve to only produce more conflicting images, distorted perceptions and diminish the overall stature of our nation and its (intellectual) culture. You can follow Smita Mukerji on facebook here. Article first published on author's timeline.